Good morning. I'm typing very quickly because I'd like to put up a blog post before the power company de-electrifies me for the day. This is the 5th attempt to take down our dying old oak tree, and it looks like it may actually happen today. And there went the power..... 12 hours later, the power is back and now my house looks naked without it's oak tree. Not a person-- and it wasn't safe to leave it up any longer-- but I am feeling a bit of grief for both the tree and the shade and the way my house looked when I woke up today. That said, I wanted to share an article with you that I read in the NYTimes Opinionator. Grieving my Patient's Friend is a heartwarming piece by Galit Atlas who is a therapist who comes to feel attached to his patient's friend, and then learns she is dying. I loved this piece because I identified with it so strongly -- I've listened to the stories of other people, imagined what they were like, and gone through their traumas, celebrations and, like the author, even their deaths. Oddly enough, I sometimes hear about the same people and their stories from several patients, or learn the fate of a friend or family member of one patient years later from another patient. She tells the story of her patient, Naomi, and of Naomi's dying friend Isabella. It's a poignant piece so I hope you enjoy it. Washington, D.C. – In the aftermath of highly publicized cases of violence, there is a big disconnect about mental illness and its connection to violence. Research shows that people with mental illness are more likely to be victims rather than perpetrators of violence. On Thursday, May 26, the global research institute RTI International will host a policy forum “Mental Illness and Violent Events: Identifying, Managing and Reducing Risks,” where expert researchers working on these issues will clarify the scope of mental illness in relation to violent events, including suicide, gun violence, and victimization. Often policymakers develop mental health policies as a response – and solution – to incidents of gun violence instead of an investment in needed mental health services, systems, and supports. Panelists will discuss the nuances these policies fail to take into account, and recommend steps for managing and reducing the risk of violence through evidence-based interventions, trainings, and services. To attend the policy forum, please register here. The forum will also be live streamed. To view the webinar, please register here. Find more information about the event here. Where: Holeman Lounge, National Press Club, 529 14th Street N.W., Washington, D.C. I just couldn't seem to get the colors right from the copy and paste, but if you're interested, go or listen anyway. APA is in Atlanta this year and I'm not there. ClinkShrink and Roy are, however, and they are tweeting. With their permission, here's a sampling of what's Twitter-worthy. I was told not to discuss the zombie game. I will vote for any presidential candidate who mandates and enforces the Oxford comma. Roywrote and retweeted:Great book to pick up at #APAAM16. Thank you, Patrick! I’ll be signing copies of A Common Struggle in the #APAAM16 Exhibit Hall at 1 PM—stop by and say hello. In sum, ClinkShrink is thinking about physician assisted suicide (thumbs down for patients with psychiatric disorders) and Roy is thinking about telepsychiatry. The Zombies are on their own. Greetings from Baltimore -- and if you're looking for me at APA in Atlanta this year -- do look for both Roy and ClinkShrink instead--they are both there as APA Assembly members. I decided a while back that a Springtime graduation was all the traveling I wanted to do, and I am pleased to tell you that all went well with my youngest's graduation from #GoBlue. I enjoyed Michael Bloomberg's commencement speech, the dinners, the celebrating, being with family, seeing my lovely daughter thrive, and knowing that for the foreseeable future, there is no college tuition to be paid. Young One is off for a couple of weeks in the Middle East traveling and will then work as a camp counselor for the summer before moving across the country to teach biology and conservation in an outdoor school. She's an adventurer. As many of you know, from many past posts, ClinkShrink and I have been working on a book since 2013 on forced/involuntary care. Many of you have helped by giving us insights into what it is to have treatments you did and didn't want, some of you (and you know who you are) are quoted in the book, and many people led me others whom I interviewed and shadowed and learned from. I wanted to give you an update. 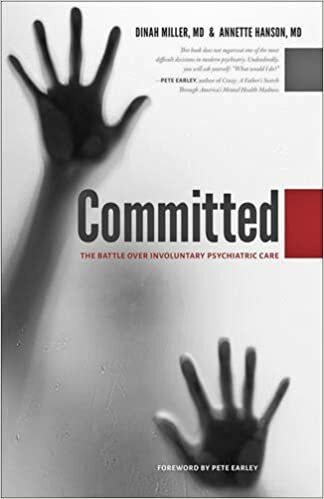 The book, which we originally called Committed: The Battle Over Forced Psychiatric Care is now called Committed: The Battle Over Involuntary Care. We preferred the smoothness of a shorter title, and the full impact of the word 'forced,' but authors don't get the final say in book names or covers, and so a committee of marketing folks felt 'forced' conveyed the wrong message. If you think the title isn't strong enough, don't worry, the cover art is striking and powerful. The page proofs have been corrected. Pete Earley wrote the most amazing foreword-- it's not to be missed. I love that Pete's foreword completes the book by adding the perspective of a family member in a way that only Pete can do. So far, the publisher's reviewers have been very positive (they nix the book if they aren't), and page proofs have been sent out for cover blurbs. Advance copies for media reviewers will be ordered and sent in June, and the official release date is November 1st, so stand by, I'll have more to say later. The Johns Hopkins University Press Fall Catalog (see page 21) just came out, and the book has an early Amazon page, waiting for more details. I just wanted to let you know what's happening, and for those who wonder why we've slowed down on blogging, well, there has been a lot to distract us. For the moment, November is tied in my head to this interminable, angst-filled presidential election and it's feeling like it can't come soon enough. 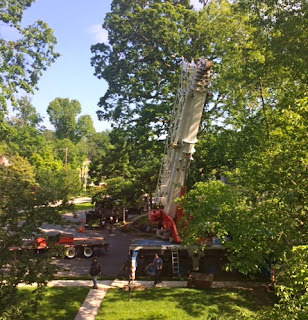 On another personal note, I am sad to report that the giant oak tree in front of my house needs to come down, and I'm waiting for the power to go off for that to happen today. I've been slowly mourning the loss of this tree for years. No, it's not a person, but it's hundreds of years old and it's part of my home.